My blue painted waterfall chest just goes to show you can make outdated furniture stylish. All it needs is a little love which usually includes paint. You guys will recognize this chest if you stopped by and read my post on the April Nashville Flea Market. (check out all my shopping info about the Nashville Flea Market here) It was one of the treasures I brought home. I fell in love with the knobs and the shape of the chest. I believe this style is called Waterfall. I’ve seen lots of similar pieces but not one like this. I think the little lip or ledge is cool. I wanted to play up the color of the knobs so I went with a pale blue in two different shades. I chose to paint the top drawer a darker blue for a little added drama. I distressed the chest using an electric sander. I guess you would call it a medium distressing job. You guys know how I love distressed paint. I’ve had some major headaches with several of the last pieces I worked on but this one was a breeze. It was in great shape structurally and with the straight lines and color finish the going was easy. It’s nice to have a project go smoothly for a change. The original knobs are the star of the show. There are very few times I choose to keep the original knobs. When I paint wood furniture I also like to modernize the look with new knobs. Not so in this case. The chest would be perfect for a nursery. I can picture it now. What do you guys think? I painted a beautiful waterfall buffet/sideboard you can see by clicking here. i love those knobs! 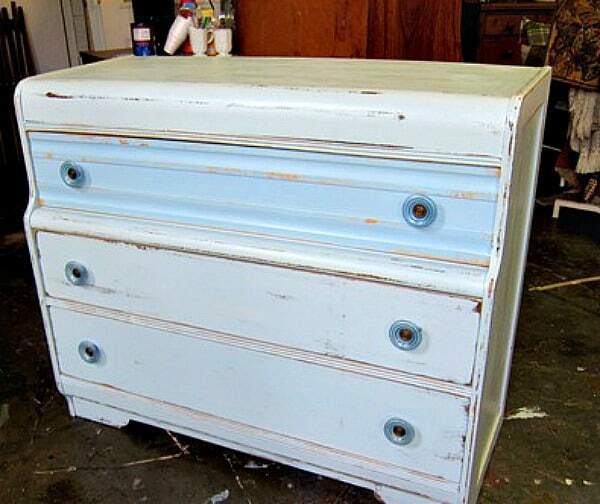 i did a dresser once that had knobs like that but they were amber…. so cool! it looks gorgeous! Luvely!!! Thanks for sharing this supercute makeover. You should do the happy dance! It's LOVELY! Waterfall is just about my fav… LOVE it!